Sure, there are many exciting and fun things you could enjoy doing with your family. For example, skiing trips, camping, taking an afternoon walk along the sea or just hanging out. But, if you’re anything like us or our friends from Kecerin Sport, sooner or later you’ll want to take your family bonding experience to the next level. In that case, only tandem skydiving in Croatia with one or more of your loved ones will do. Igor and his daughter Ea recently did just that. 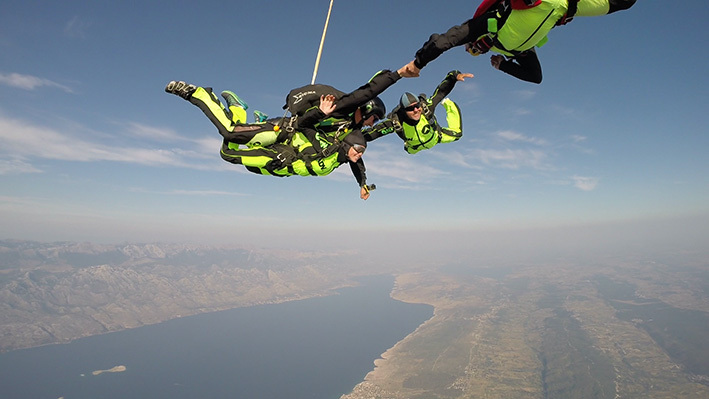 After taking in the sights during their 15-minute panoramic flight to the jump altitude, they enjoyed jumping out of the ADV Cessna 206 and free-falling from 3000 meters above our beautiful dropzone near Zadar. But you don’t have to be an experienced skydiver like Igor to enjoy tandem skydiving with a family member. You can book a tandem skydive with us right now via our website and choose a time slot which suits you the most. The only thing to keep in mind is that your son or daughter must be at least 14 years old to be legally allowed to skydive. In other words, kids between 14 and 18 years of age require written parental consent. You could also choose one of our video options. That way you’ll have an everlasting memory of tandem skydiving with your loved one which you can always revisit.